Last week in Part 4 of this series we looked at how a humble stop watch can be used to reveal the on-road truth about mods as diverse as oil additives, exhausts, intakes, camshafts and boost controls. This week we’re going to increase the number of performance testing tools you’ll need – but don’t worry, they’re still very cheap. In a turbocharged car, a boost gauge is a vital tool – both in seeing what’s happening on a day-to-day-basis and also in assessing performance mods. Strangely enough, many people forget all about the latter use! To use a boost gauge in this way, you’ll need to correlate boost with another variable – usually engine rpm. Using an assistant (to drive or write), you note down the boost reading each thousand rpm in the one gear. If the rpm rises too fast to do this easily, do it in a few goes – eg firstly 2000, 4000, 6000 rpm, and then on another run, 3000, 5000 rpm, etc. In this way you get a curve that can be graphed. Not of much use? It sure is! 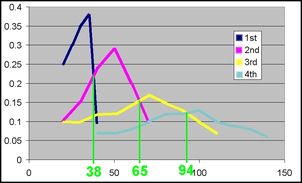 Here are four different boost curves recorded by my former colleague Michael Knowling. 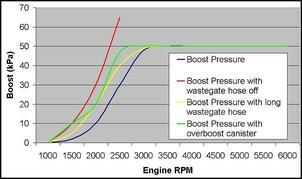 They show the boost behaviour of a turbo on a VL Commodore. 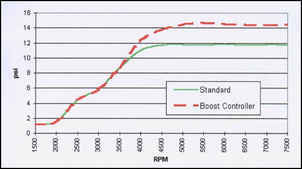 The dark blue line is the standard rate of boost increase, while the red line shows what happens with the wastegate hose disconnected. The yellow and green lines show how Michael was able to tweak the boost control to bring up boost faster than standard, without overshoot. This sort of modification is cheap and gives a real-world performance advantage. Here is the performance of another very cheap boost control, this time working on a Skyline GT-R. I didn’t want boost coming up any faster (ie I wanted factory throttle control) but I wanted the boost to rise to a higher level. As can be seen, the controller achieved its aims. Another way of using a boost gauge is to detect when a certain boost level is first reached. This can of course be done with a full graph, but it’s easier to just record the revs. When I was modifying a Peugeot diesel 405, one of my aims was to bring up boost more quickly. With a new exhaust, a level of 7 psi of boost was achieved 800 rpm earlier in the rev range. A boost spike is a sudden overshoot from the designated boost pressure. For example, if boost is set to 15 psi but during hard acceleration rises for 1 second to 20 psi before again dropping back again to 15 psi, a spike has occurred. This occurs when the boost level reaches a peak (eg at max torque) and then gradually falls in level through the rest of the rev range. This can occur in pneumatic systems (that don't have any feedback loop) as compressor efficiency drops off or pressure inadvertently builds again in the wastegate line because of control problem. If the boost at full throttle constantly varies up and down (eg by a few psi) the car is said to have a full-boost surge problem. This is common in poorly set-up or badly designed electronic boost control systems featuring feedback. Last week we measured vehicle acceleration by timing how long it took to move from one speed to another. But it’s also possible to directly measure vehicle acceleration. Performance measuring accelerometers are available in two types - electronic and mechanical. Electronic accelerometers are most often integrated into full digital performance computers, and also consumer goods like phones (the I-Phone has an inbuilt accelerometer, and low cost applications software will display the acceleration reading on the screen). But what if you don't have the money for an electronic accelerometer? A mechanical accelerometer is cheap and easy to obtain and use. Compared with an electronic accelerometer performance computer, it requires much more work from the user - but there are always going to be some trade-offs! A mechanical accelerometer measures acceleration only in 'g' units, not 0-100 km/h or quarter mile times. A mechanical accelerometer can use either a vertical pendulum that is deflected across a scale by acceleration, or a tube shaped in a semi-circle in which a small ball bearing is moved. 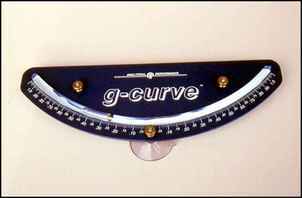 A US company called Analytical Performance many years ago produced one of the best of the latter type of accelerometers, which was called the G-Curve. Their accelerometer consisted of an engraved alloy plate into which was let a long curved glass tube. The tube was filled with a damping fluid and a small ball bearing was sealed inside. A very good handbook was also provided with the instrument. Unfortunately it appears that Analytical Performance is no longer in business but a substitute accelerometer can easily be assembled. Boat and yatching supply companies sell clinometers that are designed to measure the angle of boat heel. 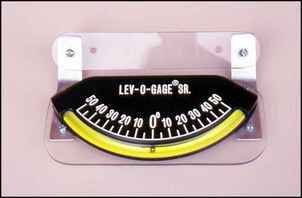 One such clinometer is the 'Lev-O-Gage', which in construction is very similar to the G-Curve. However, because it is designed to measure heel angles, the scale is calibrated in degrees rather than g units. Like the G-Curve, the glass tube is filled with a damping fluid to prevent the ball overshooting. Both accelerometers are attached to the car in the same way. To measure longitudinal acceleration, the instrument is mounted level and parallel with the direction the car is moving. This means that the accelerometer is often mounted on the passenger side window. The G-Curve came with suction caps to allow this to be easily done, but the Lev-O-Gage is designed to be fixed in place with double-sided tape and so a suitable bracket should be made and then equipped with suction caps (available from rubber supply shops). So how does the accelerometer work? When the car accelerates, the ball climbs up one arm of the curved tube, showing how hard the car is accelerating. To convert the degrees reading of the clinometer to g readings, simply use a scientific calculator to find the tangent ("tan") of the number of degrees indicated. This means that if the car is accelerating hard enough to move the ball to the 20 degree marking, the acceleration is about 0.36g (tan 20 = 0.3639). However, note that converting the degree readings into g's isn't necessary for most testing, where you are only trying to see changes rather than measure absolute values. Like the G-Tech Pro, the mechanical accelerometer must be accurately levelled before performance measurement can take place. The accelerometer will clearly show any road gradient and so levelling is best done on a flat road. If the road is not level (and many that look level aren't! ), the instrument needs to be adjusted so that the error when the car is parked facing in opposite directions on the same spot is of the same amount but in different directions. For example, the clinometer might show +2° with the car facing in one direction and -2° with it facing in the other. If the road was level, the instrument would therefore show 0°. Using a mechanical accelerometer requires a sharp-eyed assistant armed with a paper and pencil to record the data. One example of the use that can be made of a mechanical accelerometer is the measurement of vehicle acceleration in a single gear. A gear is selected and the car driven at as low a speed as is possible in that gear. After warning your assistant that you are about to start the run, yell "now!" and quickly push the accelerator to the floor. Every 1000 rpm after the initial rpm figure yell "now!" Each time you yell, your assistant records the accelerometer reading. In many cars the acceleration will be too quick for the assistant to keep up, so as with recording boost gauge readings, on the first run do for example 2000, 4000 and 6000 rpm, and in the second run do 3000, 5000 and 7000 rpm. The graph here shows an example of some 3rd gear acceleration runs done in this way on a turbo car – a tiny 660cc turbo Daihatsu. In the first run the car was tested with the standard exhaust and standard boost pressure. The vehicle was then modified with a large exhaust and increased boost. As can be seen, the improvement was spectacular! The low rpm performance remained the same in both configurations as the turbo was yet to begin boosting, but once the turbo started developing boost - wow! The peak acceleration in 3rd gear went from 0.21g to 0.34g, a 62 per cent increase! The acceleration also remained higher for much longer, with the car accelerating an amazing 67 per cent harder at the redline in modified form. 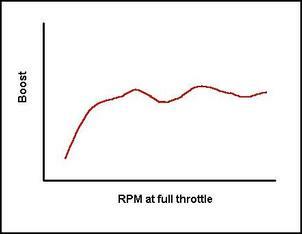 While the test mentioned above measured the effect of changes in the boost and the exhaust, using an accelerometer to also test turbo swaps is a very valid way of assessing results - better than using a dyno, in fact. 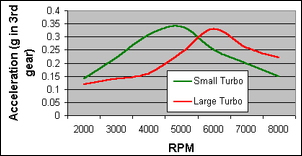 The change in low rpm response of one turbo swap can be seen here. It’s again on the tiny Daihatsu, and the mod is what I’d today call a failure. Another very effective use of the accelerometer is to plot the best gear change points. 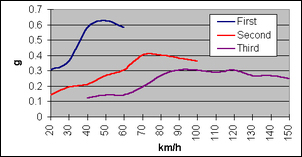 Instead of acceleration being plotted against engine speed as was described above, it is plotted against road speed. The acceleration in each gear is measured, with the numbers being jotted down each 5 or 10 km/h. Each gear is tested from as low as speed as possible to the maximum speed possible before the engine redline. 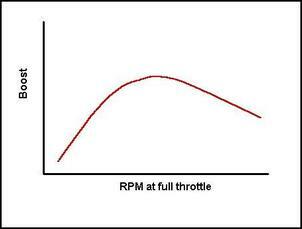 Doing this results in the sort of diagram shown here, which is for a Subaru Liberty RS. 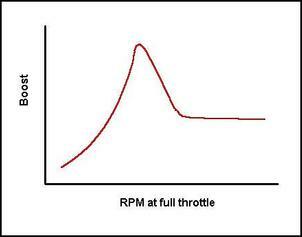 As can be seen, in the Subaru the maximum possible acceleration occurs if all gears are held to the redline. This is because each time a gear change is made, acceleration drops markedly. The first gear change drops acceleration by a massive 47 per cent - it appears that the modified Subaru could use either a taller first gear or a higher engine redline. However, as you can see in this diagram, short-shifting will give quicker acceleration in some cars – this is for a Holden JE Camira. Here a slightly early change from second to third gear (at about 77 km/h) will improve acceleration. This is because holding second gear to the red-line results in the car being slower than if the early change to third gear is made. Finally, here’s another gear-change point graph – this one hasn’t been smoothed, so explaining the jagged lines. It’s for the modified diesel Pug 405 mentioned earlier, and, as can be seen, if you’re after best performance, in this car you should definitely not hold all gears to the redline! In fact, the gear-change point for 1st – 2nd should be at 38 km/h (4750 rpm), and from 2nd to 3rd at 65 km/h (4250 rpm) and from 3rd to 4th at 94 km/h (also 4250 rpm). Note that using an accelerometer in this way is vastly more accurate than trying to calculate the best shift points using torque curves, gear ratios and so on. Smart use of a normal boost gauge and a purpose-bought clinometer will tell you a lot of information about what your car is doing, and how its performance is changing with modifications.